In a meeting last week, the Scientific and Cultural Facilities District (SCFD), which oversees public funding for hundreds of metro area cultural institutions, disclosed an operating budget deficit that could affect the reauthorization of this tax in 2016. CPR arts reporter Corey H. Jones investigates how the SCFD intends to address the issue. 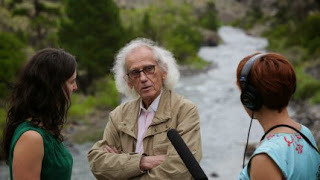 Arts editor Chloe Veltman and news director Sadie Babits meet up with acclaimed artist Christo in Salida. For more than 20 years, the artist has been developing a project to suspend miles of fabric over the Arkansas River. He speaks at length about the logistical and legal challenges that have arisen during the process so far. In live theater, actors typically take center stage. But for Maggie Stillman, founder of the Byers-Evans House Theatre Company in Denver, the building kept stealing the spotlight. Chloe Veltman speaks with Stillman about splitting from the museum, rebranding her company and why the ensemble waited a year to debut its first production. Both brews and beats are on tap this weekend in Fort Collins for the first-ever “Hip Hops: A Brew Tour.” As the event gets underway, Colorado rapper and festival organizer Qbala shares an exclusive track from her yet-to-be-released CD. The Colorado Art Report airs on Fridays at 10.30 a.m. and 7.30 p.m. Tune in live or access online at any time. The weekly show is now also available as a podcast via iTunes and the NPR podcast directory.